Jordan Spieth is in the early mix at Royal Birkdale as he tries to add a British Open title to his collection of major championships. Ian Poulter also had quite the day, making only one bogey on his way to a 3-under 67 that gave him the clubhouse lead among early finishers. Spieth, who narrowly missed getting in a playoff two years ago at St. Andrews, set the tone for his day when he slashed an iron out of the rough on the second hole to within 10 feet for his first birdie. He added two more to finish off the front nine and was at 3 under on the back nine. Spieth, who did not make a bogey through 12 holes, has won both the Masters and the U.S. Open but has yet to hoist a claret jug. Neither has Poulter, who is winless in major championships and looking to rebound from a long dry spell in his pro career. The Englishman played steady before making birdie on the par-5 17th hole from the bunker, then getting up-and-down from another bunker on the 18th hole to post the lowest score so far at the Open. One of the first players out on the course has the early clubhouse lead in the British Open. Stuart Manley isn’t exactly a household name, but the journeyman from Wales used an eagle-birdie finish to shoot a 2-under-68 to climb atop the leaderboard at Royal Birkdale. Manley has been a pro since 2003, bouncing between minor tours and the European Tour. He has missed the cut in his last six tournaments, and is currently ranked No. 520 in the world. England’s Ian Poulter is also at 2 under on the back nine, while another half dozen players were at 1 under on a day where birdies were at a premium. Half the field is now out on the course at the British Open, where the umbrellas have been put away – at least for now. The early starters encountered some wet conditions, but showers gave way to clouds and some sunshine on a breezy day at Royal Birkdale. A pair of Englishmen had the early lead in their home tournament. Justin Rose and Ian Poulter were both at 2 under on a day when birdies were hard to come by on one of the toughest courses in the Open rotation. Birkdale is where Rose made his debut in the Open as a 17-year-old amateur in 1998. 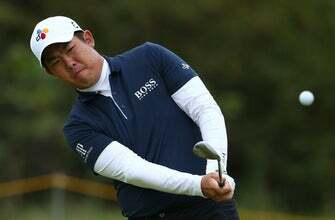 Though he has won a U.S. Open, Rose has never won one of his own country’s national championships. Several players were at 1 under, including Americans Jordan Spieth and Justin Thomas. In the space of just one hole, Jordan Spieth showed the trouble he may face in the British Open and his unique way of turning it into his advantage. Spieth hooked his tee shot badly on the second hole, with his ball ending up in the deep wispy rough left of the fairway. He took a mighty swing at the ball, and then watched as it barely cleared a bunker on the right and rolled to about 10 feet away. Spieth, who has been known to hit some tee shots sideways, then rolled in the putt for a birdie that got him under par for the first time in the championship. The former Masters and U.S. Open champion was in form coming into the tournament, after winning the Travelers Championship in his last outing. He showed his escape abilities there, too, holding a shot from the sand in a playoff to win his 10th title as a professional. Royal Birkdale has traditionally been one of the toughest courses in the British Open rotation. And it is living up to its reputation early in the first round of the 146th version of the major championship. With the first wave of players making the turn, there were few red numbers on the board. Only two players were under par, led by Ian Poulter at 2 under through five holes. The good news is the weather – rainy and breezy in the morning – is expected to get better as the day goes on. That should favor players with later tee times on the course on the coast of northwest England. Alex Noren has birdied the first hole at Royal Birkdale in the British Open. Already one of the toughest opening holes on Open courses, a strong breeze off the Irish Sea and a light rain made the 448-yard hole even more of a beast Thursday morning. Mark O’Meara had to hit two tee shots because the first one went into the gorse. He made an 8. Bryson DeChambeau also hit into the gorse. He made a 7. It was a feat just to hit the green in regulation, so consolation prizes to Paul Broadhurst, Ian Poulter and Russell Knox. As the rain and wind eased, Noren hit his approach into 5 feet and hole the putt for a 3. That’s something 26 players before him couldn’t do. Mark O’Meara was supposed to hit the first tee shot to start the 146th British Open. He wound up hitting two of them. The British Open began Thursday morning with rain, wind and big numbers. O’Meara’s opening drive on the notoriously tough first hole at Royal Birkdale rode the wind into the gorse bushes on the right. He hit another tee shot, this one into a bunker on the left. O’Meara, who won at Royal Birkdale in 1998 and is playing his final British Open, made quadruple-bogey 8. Ryan Moore took a double bogey and Chris Wood had to get up-and-down from 40 yards for a par. It was an ominous start at a links course not known for low scoring.